Tie-wraps are one of theose must-have items, on all kinds of boats. Every boat has a hull, a power source (even if it’s you, with a paddle) and some form of deck. Beyond that, there’s no common denominator. All boats are different, some radically so. But no matter whether you’re talking about a bass boat, a cabin cruiser, or a mega-yacht, they do all have one more thing in common: stuff breaks. So no matter what type of boat you own, these five items should always be handy. DUCT TAPE – This stuff fixes everything (temporarily) from busted latches to ripped seats. You’re nuts if you don’t keep a roll onboard, stowed away in a zip-lock baggie to prevent water damage. 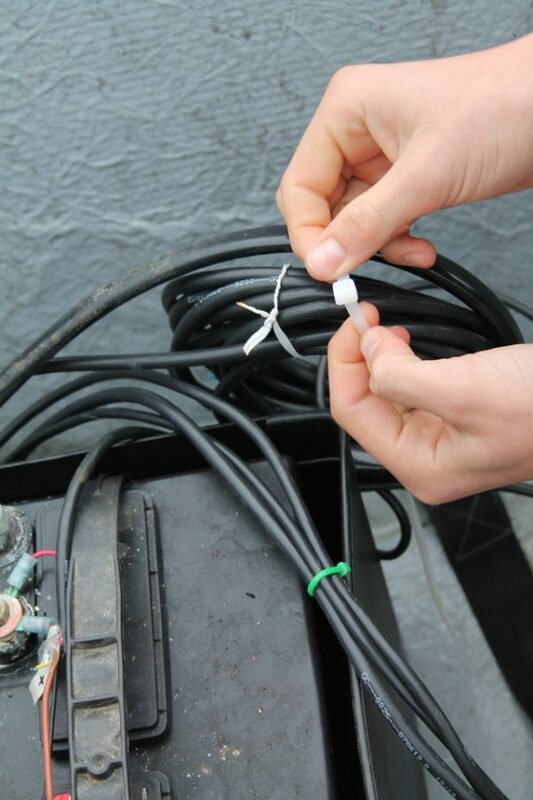 PLASTIC TIE-WRAPS – Every boat has wires, lines, and bundles of this or that, and nothing keeps loose things bundled better than a simple plastic tie-wrap. These things can also be used to temporarily hold items together when a fitting breaks, keep a coil of line firmly coiled, and secure loose items in place. Just make sure you use the plastic kind, which won’t ever rust. A BASIC TOOL KIT – You know the drill (pun intended). It should have bare necessities like screwdrivers, pliers, a cutting implement, and that little can of magic we call WD-40. A BASIC FIRST AID KIT – It’s always boggled my mind that people leave the dock without one of these. You bring along stuff to make basic fixes to your boat, but nothing to fix injury to the body? Not so much as a Band-Aid? C’mon, get smart. AN EPOXY PUTTY STICK – These things are handy for plugging leaks, repairing broken parts, and holding stuff together when it wants to come apart. It works on both metal and fiberglass (and just about everything else), it sets quickly, and using it is as simple as rolling the putty between two fingers, then pushing it into place. Of course, there’s lots of other stuff that also belongs on your boat, and what exactly that stuff is depends on where and how you do your boating. But no matter what type of craft you own and no matter how you use it, one thing is for sure—all five of these indispensable items belong aboard.